A few of the most important questions we receive about our product line and waterproofing are: , “How do you ensure your clients and contractors are waterproofing right the first time? What is it about SureCoat Systems that is different? How do we know that the product we are installing is really waterproof?” The answer is simple. It comes down to the formulation of the product you’re using. Specific guidelines have been established for testing and approval of liquid-applied roof coatings that help demonstrate how a product performs and if it will work to specification. Important standards tested are things like viscosity, elongation, tensile strength, accelerated weathering after specific lengths of exposure, adhesion, tear strength, permeability, UV resistance, and low-temperature flexibility. Creating a waterproof barrier is the ultimate goal of any roof system, and that’s why we want to focus on this one specific and critical standard known as perm rating, but more importantly a Class 1 perm rating. Acrylic coatings are typically very breathable, meaning they have a high transmission rate of liquids or gases. These coatings are for decorative use and some UV protection; NOT waterproofing. Silicone coatings are also breathable, and perm ratings vary based on the blend and application thickness. Typically ratings are 1.000 to .0600 for silicone. 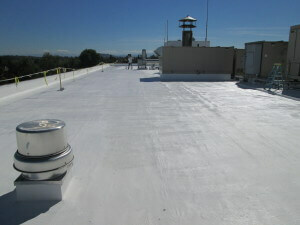 Single ply roof systems such as hypalons, neoprenes, butyl rubber, etc., have perm ratings in the .0400 to .0800 range. It should also be mentioned that a perm rating should not be confused with resistance to weathering. Formulation and installation specification are also factors that help ensure optimal performance and adequate weather resistance. Want to hear more about SureCoat Systems Best-In-Class Perm Rating and proven performance in the field? 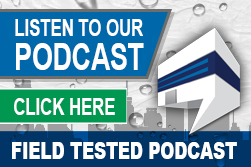 Listen in to our recent episode of Field Tested! When it comes down to it, the most important thing to remember is “the lower the number, the better”. Now, keeping that low number rule in mind, let’s look at the classes of ratings. In the building material industry, a perm rating of less than 0.1 is considered a Class 1 barrier meaning that it is deemed impenetrable by any liquid or gas – aka the best in class because it is completely waterproof. A perm rating between 0.1 and 1 is considered Class 2 meaning that it is semi-permeable, or some transfer occurs, and a perm rating between 1 and 10 is a Class 3 permeable material meaning that a liquid or gas can fully penetrate it – aka not water resistant at all. So, we pose this question to you; when you’re in the market for a waterproofing roof system that extends the lifecycle of your roof, what type of product are you going to choose? SureCoat has been tested and proven to be the solution for flat and low slope roofs across the country, performing in challenging conditions with roofs that have multiple components that need to be addressed. The outcome is always the same – less labor and no go-backs. We have one of the lowest published perm ratings for elastomeric roof coatings at a .0025. That is way less than 0.1 meaning we are a Class 1 rated roof system, absolutely no moisture penetration here. The proof is in the numbers. To get started visit www.surecoatsystems.comor call us at 877-8 BE SURE to talk to one of our waterproofing specialists to get started today. We’ve got 10 more reason why SureCoat is a sure bet. Click here to download Top 10 Reasons to Use the SureCoat Roof System.